Elliott and I went on a date last night. It feels like we haven't done that in forever. We have an awesome Indian restaurant near our house which we went to for dinner, and then afterwards we went to the IMAX theater and saw Tahiti Big Wave in 3D. It was a really cool movie. Poor Elliott. He misses living near the beach and being able to surf. Anyway, we had a little while before the movie began, and I was saying (as I say about once a week) that I am getting so big I don't think I can possibly get any bigger. There was no one around, so we took a picture. 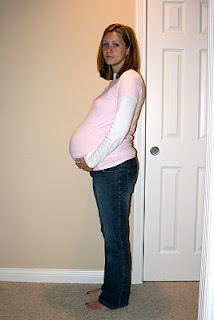 Compare that to this picture of me pregnant with Sophie. We just happened to snap a few pics the night before she was born. Hmmm, looks like yes, I do still have some growth ahead of me. And Sophie even came 6 days early! I have to say that my kids are being great about helping around the house, as there is just a lot I can't do. The boys especially do a lot for me, including now even emptying out the dishwasher. We are having such a great summer. I'm bummed school will be starting in just one month. It is too early. Oh my gosh -- is it only another month or so? Time has sure flown -- probably not for you though LOL! You sure look cute! Yay! I was just thinking last night that I needed to ask you for another picture before we left for Spain. You're looking good! Are you getting swollen like you did with the other kids? Your ankles look pretty thin, still, in that picture. I'm surprised the Indian food doesn't give you heartburn. I'm getting so excited for you to have Henry here. Hope the last 5 weeks go well. We're thinking about you. I hate to write this, but you don't look as 'full' as with Sophie. :( Need a little ripening. Looking good! It always amazes me when I get bigger. Surely it would be physically impossible to get bigger, and then I do.